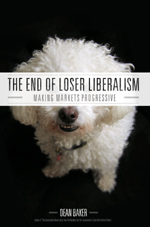 This ‘loser liberalism’ is bad policy and horrible politics. Progressives would be better off fighting battles over the structure of markets so that they don’t redistribute income upward. This book describes some of the key areas where progressives can focus their efforts in restructuring market so that more income flows to the bulk of the working population rather than just a small elite. Dean’s argument lines up with the Keystone Research Center’s view that the issue is not market vs. government, but how policies and institutions shape marketplace competition and its outcomes (this overlap is why we're NOT loser liberals — phew!). Will we have constructive competition (based on innovation, increasing productivity, and rising living and environmental standards) or destructive competition that lowers wages and despoils the planet? Will we structure markets so that companies take the “high road” to profitability or the “low road”? Go online Sunday and let us know what you think. And start experimenting with Dean’s reframing in your own communications.